As I mentioned, I like buying things — whether they are kitchen tools, boots, whiskey, brandy, meals, or even writing gear — from artisans who pursue ideals with single-minded focus. In particular, I’ll revisit cooks and chefs who obsess over details. 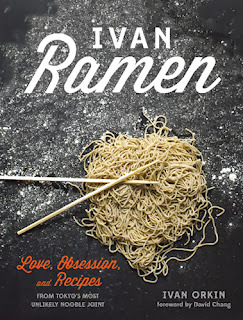 I’ve never visited one of Ivan Orkin’s restaurants, but when he dedicated the bulk of his recent book Ivan Ramen to the proper preparation of one single bowl of shio ramen (at least, the way he makes it), it was as if I’d stumbled across a lost cousin. Orkin, a New Yorker who founded the small Tokyo noodle soup joint Ivan Ramen in 2007, has made a name for himself not just as a curiosity — a gaijin who makes ramen — but as a cook and restaurateur who makes proper Japanese noodle soup with meticulous attention to technique and ingredients. His book opens with a short biography and is sprinkled with a few interviews of ramen enthusiasts, then dives into recipes, over 40 pages of which detail the construction of a bowl of shio (“salt”) ramen. Forty. One bowl of noodles. Makes Julia Child’s recipes seem terse. That’s not to say that the recipe for making the bowl of ramen as he makes it in his shop is difficult. Aside from the logistical obstacles a cook in London, Munich, or St. Louis might have finding the exact same chicken or flour, the recipe is straightforward; it’s long because Orkin gives the recipes for rendering chicken fat, for stock, for noodles, for making sofrito and shio tare (the mélange of salt, sofrito, and water that gives a salty flavor to Orkin's “salt” ramen). And then there are eggs. Some weeks, I’ll slurp down three or four bowls of ramen and, when they are an option, I’ll include cooked eggs either in the bowl or on the side. Shops rarely get the eggs right. Often, they are so overcooked that a greenish-grey ring with more than just a whiff of dog farts surrounds the yolk. You shouldn’t even use those for egg salad or deviled eggs. Maybe for feeding the dog before letting her out of the night. But there’s another way to do eggs: hanjuku tamago, eggs with softly set whites and semi-liquid yolks. Now these are eggs worth making. David Chang in his Momofuku cookbook recommends cooking eggs at 5 minutes and ten seconds exactly. Orkin takes slightly longer in his Tokyo shop: six minutes and ten seconds. Get a timer if you don’t have one. Try these eggs. Find a time that works for your elevation, the size of eggs you use, and the degree of gooeyness you like in your yolk. Six minutes works for me about 200 feet above sea level in San Diego. After an extensive search, I found one that tasted great, had the most brilliant orange yolks, and peeled easily. (Believe me, when you have to peel two hundred eggs a day, that's an important criterion.) Then I spent almost as much time figuring out how to cook the eggs properly as I did perfecting the noodles. But I've got it now: punch a pinhole in the bottom, boil for 6 minutes and 10 seconds, stirring gently for the first 2 minutes, then ice immediately. Once they're cool, the eggs are peeled and soaked in a light shoyu tare...Sliced in half and served at room temperature atop the ramen, the eggs are a perfect supporting cast member for the soup and noodles, adding an extra touch of color and unctuousness to the bowl. Simmer the sake and mirin in a saucepan over medium-high heat for 2 minutes to cook off a bit of the alcohol. Reduce the heat to low, then add the soy sauce, sugar, garlic, and ginger and simmer and stir for 10 minutes. Let come to room temperature; you can store the mixture in the refrigerator for up to a week. Bring a large pot of water to a boil. You want a big pot so that when the eggs go in, the temperature won't drop too drastically, and the water will quickly come back to a boil. 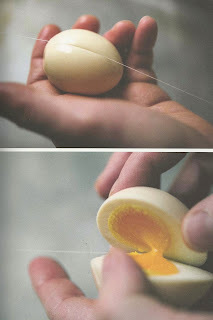 Poke a small hole in the bottom (larger end) of each egg with a pushpin. Gently slide the eggs into the boiling water. Start your timer. Stir for the first 2 minutes. Prepare a large bowl of ice water to shock the eggs. The total cooking time for a large egg in Tokyo is 6 minutes and 10 seconds. You might decide to adjust that time depending on the size of your eggs, how many you're cooking, or what the chickens were thinking about when they laid them. Remove the eggs after 6 minutes and 10 seconds, and immediately place them in the ice bath. Stir until there are no pockets of hot water. In a large bowl, combine the shoyu tare with the liter of water. When the eggs are cooled completely—after about 15 minutes—peel and soak them in the seasoning liquid for 2 hours in the refrigerator. The eggs will hold in the soak for 3 days. When it comes time to slice the eggs and add them to the ramen, a taut nylon fishing line gets the job done without losing any of the precious yolk. Ivan Orkin is on Twitter. Check him out. Tampopo, Jûzô Itami’s 1985 "noodle western" that seemingly every ramen enthusiast (including Orkin and yours truly) know and love. Mark Robinson's Izakaya: The Japanese Pub Cookbook and its recipe for pu-erh glazed walnuts. Chris Bunting's great guide to shops, pubs, breweries, distilleries, and drinking customs of Japan, Drinking Japan. How else do we like using eggs around here? In homemade marshmallow creme, in Dutch advocaat (by way of San Diego), maybe a dish of Eggs, William S. Burroughs, and pickled as either Pennsylvania Dutch bar eggs or bread-and-butter pickled eggs. Rowley at home. There's also a 2,000-volume culinary library, but whiskey bottles capture the light better. I'm Matthew Rowley. I wrote the book on moonshine. No, for real. I'm a contributor to Whisky Advocate, contributing editor for Distiller magazine, a former board member of the Southern Foodways Alliance, and an erstwhile museum curator. After a life of living in bitterly cold and unspeakably hot places, I'm lucky enough to be working my tail off in southern California. Can't beat that with a stick. My day job is freelance writing for business, government, and academic clients. When I’m not helping others get their stories out, I’m eating and drinking, planning to eat and drink, or, relying on my training as an anthropologist and museum curator to reflect on what I’ve eaten and drunk. I travel whenever I can, visiting distillers, artisan food producers, secondhand bookstores, and farmers’ markets. Sometimes I manage to write about it here. Since 2001, I've traveled around the world interviewing extra-legal distillers to debunk the notion that moonshining is a dead or dying craft. 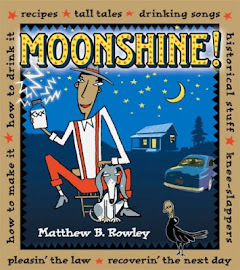 You can check out the results in my 2007 book Moonshine. For fun, there are plugs and interviews at the New York Times, San Francisco Chronicle, Publishers Weekly, the Los Angeles Times, and Wired. It's warmed my heart that modern "very small batch" distillers, far from being a dying breed, continue to send and bring me bottles and jars of hand-cranked whiskeys and brandies. Click here for my disclosure statements and directions for sending samples. What is that White Film on My Silicone Ice Trays? So Who Makes Costco's Kirkland Signature Bourbon?